Joseph Heller’s 1961 war comedy Catch-22 is one of the most beloved novels of the 20th century, not to mention one of the funniest. Here are a few interesting bits of information about both how Heller’s story came to be and the legacy that it left behind. Heller recalled the birth of his most famous novel as if it were a classic movie scene. While lying in bed in his apartment on the West Side of Manhattan in 1953, Heller was struck with what would become the iconic opening line of the story: “It was love at first sight. The first time he saw the chaplain, ‘Someone’ fell madly in love with him,” with ‘Someone’ holding the place for Heller’s protagonist’s eventual name, Yossarian. Over the course of an hour and a half, he developed the basic plot and collection of characters that he’d ultimately pour into his novel. 2. ... AND WROTE THE FIRST CHAPTER THE FOLLOWING DAY AT WORK. Heller was an advertising copywriter when he had the idea for the novel. He spent the workday following his creative epiphany, writing out the entire first chapter of what would become Catch-22 by hand. He submitted the chapter to New World Writing magazine by way of a literary agent, and a full year passed before he completed a second chapter. 3. HELLER WENT THROUGH FOUR NUMBERS BEFORE LANDING ON 22. The original title of the story, as published in New World Writing, was Catch-18. Acquiescing to his publisher’s qualms about confusion with the similarly themed novel Mila 18, Heller dragged his title through a sequence of changes: Catch-11 (which was deemed too similar to the contemporary film Ocean’s 11), followed by Catch-17 (which posed the same problem with Billy Wilder’s war movie Stalag 17), and then Catch-14 (which Heller’s publisher thought just didn’t sound funny enough). Finally, the writer landed on Catch-22. 4. MANY CHARACTERS WERE BASED ON HELLER’S FRIENDS. Heller was a veteran of World War II, and he based a number of Catch-22’s characters on his army buddies. Yossarian’s name is believed to have come from fellow Air Force soldier Francis Yohannan (who, like the character, was Assyrian). Additionally, the sociopathic Milo Minderbinder was designed with Heller’s childhood friend, Marvin “Beansy” Winkler of Coney Island, in mind. 5. THE AUTHOR WAS ASKED FREQUENTLY ABOUT YOSSARIAN’S ETHNICITY AND RELIGION. The protagonist’s ethnic background has been cause for debate since the book’s publication. In Catch-22, Heller introduces Yossarian as Assyrian, despite the fact that his surname suggests otherwise. In response to readers’ curiosity, Heller amended Yossarian’s heritage in Catch-22’s 1994 sequel Closing Time. In the second book, Yossarian was declared Armenian. 6. THAT SAID, EARLIER DRAFTS INCLUDED A GREATER JEWISH INFLUENCE. 7. THE BOOK WAS INITIALLY ONLY POPULAR ON THE EAST COAST. 8. BUT EARNED THE WRATH OF THE EAST COAST’S PREMIERE CRITICS. 9. THE AUTHOR WAS PRINCIPALLY INSPIRED BY ONE NOVEL. While Heller recognized a number of influences on his writing, including novelists Louis-Ferdinand Céline, Evelyn Waugh, and Vladimir Nabakov, the author once identified a single work that convinced him to write Catch-22: the dark World War I comedy The Good Soldier Švejk by Czech author Jaroslav Hašek. 10. BUT HE WAS ACCUSED OF PLAGIARIZING ANOTHER. 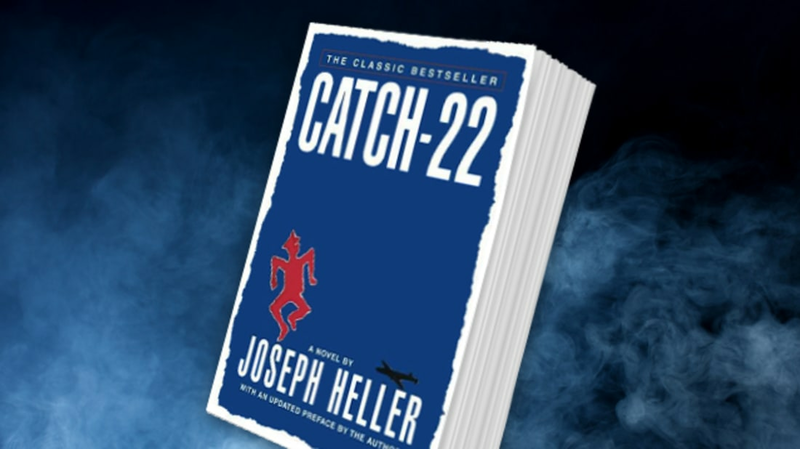 Thirty-seven years after the publication of Catch-22, the book came under fire for similarities to the 1950 war novel Face of a Hero. Londoner Lewis Pollock made the connection in 1998 and contacted The Sunday Times to condemn Catch-22 as a rip-off of the obscure Louis Falstein story. From there, the accusation gained international traction and eventually reached Heller himself. The author rejected Pollock’s claims, insisting that he had never read Face of a Hero prior to the controversy. Furthermore, his editor combated the theory by asking his interrogators why Falstein, who had only passed away in 1995, would never have broadcast any such concerns if they had borne any weight. 11. A DELETED CHAPTER GAVE MAJ. MAJOR A DIFFERENT BACK STORY. One of Heller’s more absurd characters is Major Major Major Major, cursed with his unfortunate handle and unfavorable likeness to Henry Fonda. Originally, Heller planned to delve into Major’s past in the States. He had written Major Major as a former English teacher from Vermont with a distaste for Henry James. 12. ONE CHARACTER PROVIDES THE NAMESAKE OF A MARVEL COMICS INSTITUTION. The Marvel Comics superhero Isaiah Bradley undergoes a series of experiments during World War II to turn him into a “Black Captain America” at the military base Camp Cathcart, named for Catch-22’s rank-climbing soldier, Col. Chuck Cathcart. 13. CATCH-22’S ORIGINAL MANUSCRIPT LIVES AT BRANDEIS UNIVERSITY. After the novel was published in 1961, Heller donated his original manuscript to Brandeis University. The Massachusetts school preserves the document today, and honored the collected works of its author in 2009 on the 10-year anniversary of his death. While director Mike Nichols’ 1970 feature film adaptation of Catch-22 didn’t find huge critical or commercial success, it was hardly as big a failure as the small screen endeavor inspired by Heller’s book. In 1973, CBS produced and broadcast a Catch-22 sitcom pilot starring Richard Dreyfuss as Yossarian. The series never got a second episode. 15. AN NBC HOST COMMITTED CATCH-22-INSPIRED VANDALISM. Journalist John Chancellor, known best as a host and correspondent on NBC Nightly News for 23 years, played host of NBC’s Today show between 1961 and ’62. During his tenure on the daytime program, Chancellor—a fan of Heller’s newly published novel—had personalized stickers reading “Yossarian Lives” printed, and pioneered a practical joke of placing them (discreetly) all over the hallways, offices, and bathrooms of NBC’s headquarters. He revealed his secret to Heller over a round of drinks following the author’s guest appearance on Today.